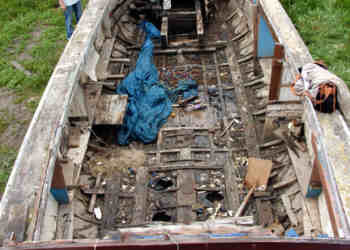 The lifeboat was spotted in 2005 on an Internet auction website in a visibly poor state. A private deal was and agreed the lifeboat was removed from the auction. The buyer initially wanted the lifeboat transported Newbiggin, Northumberland where it could be restored alongside another ex - lifeboat. However, contact with interested people in Whitby revealed a level of enthusiasm for seeing the lifeboat returned to Whitby for restoration. A meeting of interested parties was held with sufficient numbers to form a trust to oversee the restoration of the lifeboat. It would likely be quite a task at cost to have the boat fully restored and would certainly require a band of willing supporters. As the author of "Into the Maelstrom - The Wreck of HMHS Rohilla" the William Riley's main rescue endeavour I was invited to become a trustee. The restoration of the lifeboat could only be done if a suitable base was found, the photograph to the left shows the boat in a poor state and is a clear example of the daunting task that lay ahead of any restoration. The content of the original index page has been split into two individual pages as it was becoming quite extensive, the second page holds information about the William Riley as an RNLI lifeboat. I recently put together a short video presenting the boat and some of the progress made during the restoration, it is not intended as anything but an opportunity of seeing the challenges faced by the volunteer workers. I have added a page detailing the record held for the boat within the RNLI which provides a history of the lifeboat movements. The former lifeboat had its first major fundraising venture in 2008 recreating the journey undertaken by the Tynemouth motor lifeboat "Henry Vernon" in 1914 to the wreck of the Rohilla. This was followed by another fundraising row in Scotland, the aim being to raise in excess of £5000, details of both fundraising events can be found on my fundraising page. Since its restoration the boat has undertaken many fundraising events and had appearances in many parts of the country., during all this time it has actively sought to raise funds for the RNLI and the trust believe that its endeavours have raised in excess of £50.000. I have pages related to the fundraising row from Scarborough to Whitby including four gallery pages. The fundraising exploits continue unabated and with the information growing I have had to divide it into pages summarising each year by itself. In 2010, the boat enjoyed successes including its participation in the Thames Great River Race in September it first outing on such a venture, the aim this time though was to raise funds for the St. Catherine's Hospice. The race is a spectacular boat race up London's River Thames attracting around 300 crews from all over the world and appeals to every level of competitor from those who enjoy fun, fancy dress and charity stunts, to serious sports men and women who aim to be the first in its category. 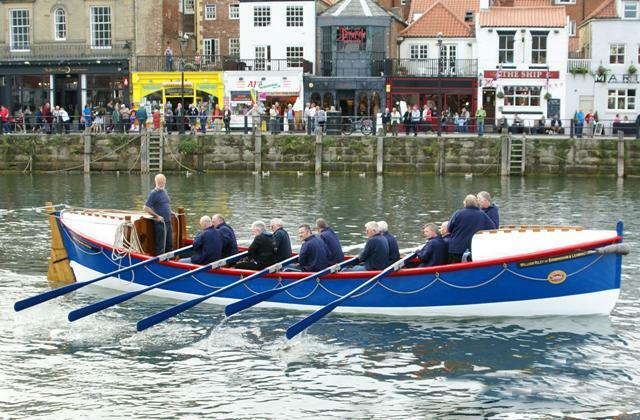 Teams from the Fishermen's club have competed in the race every year and have won some of the top prizes, but it is the first year they have been able to take the William Riley. Fishermen's club captain, Barry Brown, said it is the first year the Fishermen's crew has raised money for the St. Catherine's Hospice and were pleased to be able to support the local cause. The same month a team of 40 rowers raised almost £5,000 for good causes in memory of a Scarborough diver who tragically died in an accident off the coast near Hartlepool. I was contacted by a researcher from the BBC Coast team who explained that were keen to involve the Rohilla rescue in its next series. As the primary contact it become a time consuming affair but something which I thoroughly enjoyed. I was able to recommend family descendants of those whom I thought were pivotal to the rescue from my database and looked forward to the filming in September 2011. In providing the details of the lifeboat museum curator I believed the BBC had the best of family members to place in its episode. Although I am possibly biased I found it a little disappointing that such a huge piece of Whitby's maritime heritage was not permitted more air time, however given the time allowed the BBC has done a good job of telling the tragic loss of the Rohilla, I am grateful that I have been permitted to include the video below which actually aired on the seventh series of the Coast program. My last opportunity to really photograph the boat was when the 'BBC' was here to film for its Coast series and the inclusion of the SS Rohilla tragedy. With the help of a few close allies we managed to capture a wealth of photographs surrounding the filming here in Whitby. It was a really busy two day schedule and the culmination of around five and a half month consulting with the BBC. Being so closely involved allowed us to get close to the action, although the bulk of the photographs and video we captured remained closed until the episode aired I have added a little taster from the many stills we have. You are welcome to browse a feature reproduced here which I submitted to the Whitby Gazette about how the Rohilla is to feature on the Coast series. The run up to the filming certainly took up the most of my time leading up to the filming itself. The Coast episode with the Rohilla tragedy aired on BBC Two on Sunday 3rd June 2011. Although it featured only a small sample of the tragedy, I really enjoyed seeing the episode. Given how far the boat has come from the almost derelict condition it was found in it has proven to be more successful than anyone could have imagined. 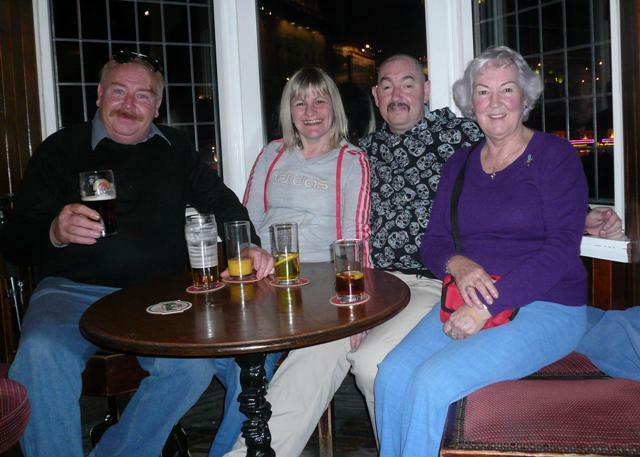 Scarborough Diving Club completed another fundraising row from Scarborough to Whitby with the money raised divided between the RNLI and the Yorkshire Air Ambulance, two very worthy causes indeed. It was a wonderful day and I am grateful to the diving club for allowing me to be part of the event, my only regret being that I am not able to experience rowing the boat for myself. I was lucky to be on the ex Dutch beam trawler which made a fantastic location to be able to film and photograph the rowers, we left the harbour at 06.00 am arriving in Whitby around midday. The former lifeboat took part in a mammoth lifeboat pull / row as part of the annual RNLI SOS Day 2012 at Torbay on the 28 January. The challenge was to row the boat between the original 1866 launch site at Mudstone (St Mary's Bay) to Brixham and then on to The Ladies Cove (Beacon Cove) Torquay. In parallel to the 'on water' pull the WAG's pulled an Inshore Lifeboat on its trailer by road from Brixham to Torquay via Paignton. There is no denying that each event on its own had its own merit, however together they formed a unique challenge. I have recently had the fortune to be supplied with a significant amount of photographs from both events that will allow me to create some upcoming galleries of the fundraising event. The William Riley was escorted by the impressive all weather lifeboat Alec and Christina Dykes and a host of support craft. From the number of images that I have so far looked through the day was not only a challenge but quite a joyful experience as seen in the photographs on the first Torbay Gallery. I have just finished creating my latest page which I aim to update as the William Riley carries on its ongoing fundraising adventures use the link to access the 2012 developments. The former Upgang lifeboat has already completed fundraising ventures including a 'Royal' engagement scheduled. 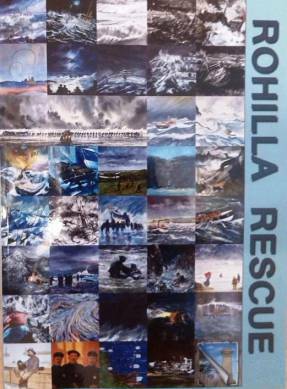 In July 2013, the RNLI commissioned the Whitby Art Society to produce an anthology of the Rohilla disaster. The society was given just six weeks to complete the project whilst ensuring the standard of excellence for which the society was famed for. In September, the 64 paintings were brought together to complete a 2m x 2m mosaic of the tragedy presenting the tale of great endurance, bravery and sacrifice. The artwork is now part of an RNLI national touring exhibition entitled Hope in the Great War, commemorating the centenary of World War One (WW1), the exhibition pays tribute to the bravery of RNLI volunteers who risked their lives to save others during WW1. I secured a small number of the books straight away and would encourage anyone with an interest in the Rohilla to purchase a copy, whilst they are available. The books are really only available from the Sutcliffe Gallery here in Whitby at the moment, if however anyone has a problem obtaining a copy I may be able to help. The Whitby Historic Lifeboat Trust had its own website, however it was not an inspiring success and soon disappeared online, although I do believe they have a update website which has quite far to go in telling the full story of the William Riley. In the meantime if you have any questions, queries or suggestions relating to the William Riley pages here, please do not hesitate to contact me using the link below. Likewise if you have any suggestions or ideas for the website I would like to hear from you. I have added a better link to my sitemap below and updated it to reflect the new pages and therefore help browsers locate a specific page, if you have any problems you are welcome to use the search facility on my main index page which searches all the pages throughout this website including those of my other sub domains.